Given your love of Liverpool, Dave, you'll be pleased to know the gegenpress seems to be op, even in football's basement. Even with some options lowered a notch from their start place the intensity bar is red, so I wouldn't play it long term with a small squad, but if you go the usual LL route of building a team high in physical fitness then your press will burn out the AI before it does you. Outside of that 4-1-4-1 press I've been using a cautious version of the "wide attack" tactic to build a 4-2-4 that parks two midfielders in front of the defence and then looks to use transition to punt the ball sixty yards to four forwards who just stay right against the defensive line. That has been working - Weston Super Mare are a team of non-contract players tipped to get relegated and I have them 7th - but if I need a result in a single game, especially at home, then the aggressive press works so well it's awful attractive. I might have to give that a look - a peep at 1860's squad leads me to believe that tiki-taka would be more like tiki-crap we've lost the ball again. Are Man U OP again this year (they were massively OP last year compared to their real outcome.). I've seen a series doing a prediction of the 18/19 premiership, although I'm not sure on how many run throughs, but United were top and I think City were 5th, which seems a little unrealistic (hopefully). I just can't resist the lure of lower leagues. Here I come (again! ), Darlington! I think my last semi-successful foray into the lower leagues was the Slovakian 2nd division, and that was about 5 years ago! United are currently 9th in my game at Christmas, 2018. City are top by a point from Liverpool, with Chelsea, the Arse and Spurs behind. Only shock really is Leicester in the bottom three. Might have been changed in the patch then, or that result was just a single play, rather than the 100 or 1000 that YouTubers sometimes do. Decided to start with my usual low-pressure Celtic start, trying tiki-taka...and I think I need to tweak it a bit to fit this squad, as we've just squeaked through in the CL qualifiers against the not-very-mighty Crusaders 3-1 on aggregate..and that's with having picked up McTominey and Zinchenko on loan deals. Things I have noticed in my first hour or two. - That purple skin is annoying me. - There seem to be a lot of goals from indirect free kicks around the sides of the box, at least in the five matches I've played. - I've delegated all training to staff, so why am I still getting these weekly email updates ? - Not sure about scouting meetings, my AM said he's filtered out the lists I used to get. Might just be me needing to play with the settings. - Good news is that copying all of my downloads from last year across seems to have worked a treat - names, kits, badges, facepacks etc. Big thanks to GoldenFM for that tip, I'd never have thought of that. I changed the skin to the official "Dark" choice immediately to get away from all the purple. So people pretty happy with the new version? Worth a buy? I mean, I am so far, but I'm in no way a reliable source as I've put in a ton of time on every release since.... well, since I got into the series back when it was still called Championship Manager. Also, I only actually have "played" the game for like 1 an hour, because I spent the rest of the time downloading facepacks/logopacks/dawdling over which team I was going to take control of. That said, speaking as a colossal FM homer, it's the usual. Small improvements on last year's game, along with some bugs that'll hopefully get ironed out (I played my first Friendly last night and after using all of my subs but the GK, my midfielder got injured and the game wouldn't let me continue until I replaced him, with what ended up being the backup GK). Bayern manager Nico Kovac has a fake name in this FM, I believe. Does anyone know why it's always German clubs (and in particular Bayern) who have naming rights issues with FM over the years? I know the Bundesliga is licensed now, but for years there hasn't been a German national team, and Oliver Khan was also replaced with a fake player. I don't know what exactly is the licensing issue there, but it's always been easily fixable with a simple mod download. Based on my 2 hour current play, I'd say that if your last FM was 17 or earlier then definitely, but it even has significant improvements over FM18, over and above the usual database updates kind of thing. The tactical screens allow you to take on board standard tactics (as Mr Bismarck mentioned above), but even those need to be looked at to see how they gel with your squad...I adopted the tiki-taka and gegenpress tactics, then wondered why in a CL qualifier my defence was caught too high upfield. A quick look at the gegenpress tactic when defending showed I was playing an extremely high defensive line, which was not really on when both of my CBs have slightly less mobility than icebergs, and similar speed. A couple of tweaks, and my problems were lessened. So I'd say yes, but I am biased towards it. I find the changes to tactics a breath of fresh air, it feels like you're more in control now, and there's less head scratching as to why things are going wrong. Saying that, I've won 3 out of my first 4 as Darlington manager, so maybe I'm getting carried away a bit! Thanks everyone! I might look to get this sooner than later. I don't know if it's the same for (I'm presuming with you) the USA, but I got my copy through Voidu for about £23. They're a certified seller via SEGA too, so they're not shady like some of the key sellers who offer big discounts. I know their prices differ by region though. Humm. $37.49 after discount code applied. The Steam key would work in the US, I wonder? That's the one thing with Voidu you've got to be careful with apparently, they won't give you a refund if it doesn't. It's best to check on the product description as it should say in there, otherwise just contact them and ask. Yeah, I poked about on the product page for a couple of minutes looking for more information but didn’t really see any. That got me wondering what (ROW) meant in the product description. Turns out it means Rest of World. I think this has something to do where the key is valid, but it’s not particularly helpful for someone who doesn’t know what it means. That implies it’s not good somewhere, right? Does it mean that it’s good for everywhere except where I live? That’d be silly, I think, maybe. At that point I decided I really should finish the other games I’m playing now before starting a new game of FM anyway, so I’m going to hold off for a bit. Thanks for the info on the site, though. I’m going to just email them and ask about the key if they still have the cheapest price when I decide to buy. It looks like they have some good deals. The demo is now available on Steam, Godzilla, if you want to give it a try. Thanks for the heads up! That might be a good option to start out with, then I can look for deals as I burn through the demo period. I do want to finish Divinity Original Sin first though. I've probably got a good month to go or more with that. Some more thoughts, now that I'm a couple of months in at Celtic. - They weren't kidding about the player interaction being greater. It seems like every time I offload some deadwood, one of the team comes running into my office to say that 'player x seems unhappy because you sold player y'. Half the time, if you just talk to them they say that you talking to them has settled them, or whatever. - I know the ball movement has been changed, but it's gone a bit OTT - some shots are curving so much that they are highly reminiscent of Sensible Soccer aftertouch. Another patch has just dropped, so let's hope that's been addressed a little. Quick note for anyone running a big club who is looking for a LB...Kieran Tiernay is one of the biggest moaners you'll ever come across. And compared to last year, he is now made of a mixture of glass and stupidity (says he, looking at Tierney who is now serving his second red card ban..in November.). It's a good job I signed Zinchenko on loan, he must be the most versatile player in the game. Omg.. I played till 2017, and found this interaction rather broken tamagochi-sort-of tiresome. They put even more into it? There's loads of it now mate - players unhappy coz they ain't playing, because I've sold one of their mates (even though I've replaced them with someone better....looking at you, Scott Brown), or because they want a new contract (which seems to be triggered by them starting about 6 games in a row). It's more annoying in that it seems like primary school - Kieran Tiernay running into my office saying 'Callum McGregor's unhappy'. I then have to speak to McGregor (there's only one option, basically 'I notice you're a bit quiet'), so McGregor will either say 'It's nothing, but thanks for talking to me' and that's it, or moan about me having sold Scott Brown, to which I have a variety of replies. But yeah, Peoj, if you found it tiresome in FM2017, it'll really wind you up as it is now. I really really hoped they would invest more of this 'Doki Doki Literature'-talkies into tactics. Or that they sort of would re introduce the wibble wobble. Sad, this reads like a final and last goodbye to a series that took a big chunk of my life and that I loved. Football, Tactics and Glory was a nice candy in-between... is there another fun Champman thing out there? You could always give the demo a shot. Wibble Wobble is sort of back in the tactics screen, in that there are areas for you to specify tactics in attack, in defence, and in transition (so WibWob, I guess). I guess the increased amount of feedback reflect the reality that in the modern game you can't just walk into a club, sell off half of the first team and ride the remaining players into the dust without getting some pushback. And it isn't really that intrusive. As I said, give it a shot and see what you think. I'm amused that I have a social group at my club that's just for Welsh people. The interaction nonsense hasn't been too bad so far. Just a couple guys moaning about playing time who get my standard lower league response of, "have you considered shutting the f*ck up?" I mean, you're a rotation player for an amateur team at the sixth level of football. I literally don't care what you do. I could replace you with a store mannequin taped to a Roomba. Go away. Seriously. 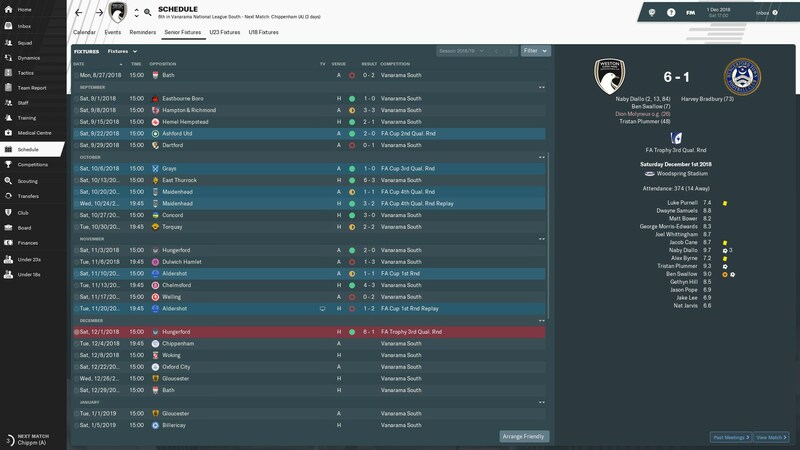 We had a squad of 16 people to start with, and when I signed a new left-back, the starter (the only one we had) started moaning about being worried he was getting replaced. Homeboy, you are literally on a non-contract, you have a Determination of 2 and the only difference between this league and Sunday league soccer is that we're not using jackets for goalposts. You are replaceable. It may be that managing a football club really is like being a primary school teacher - if so, the sim and reality come even closer. And Pred, having played Sunday League soccer (one season, many years ago for a British Legion team), I can say that we actually used goalposts and nets, provided someone remembered the nets. I can also say that jumpers for goalposts would never work because most people were so hungover that putting a coat on top of another coat would be an act of manual dexterity way in advance of anything that could be managed in less than an hour. I can also reveal that playing with a goalie still recovering from magic mushrooms is...problematic. We've had a couple bad results recently, "show me something different today." Appropriately for FM, 4-0 up at halftime I still wasn't totally convinced we'd win. 23 goals from my five starting midfielders will do nicely. I almost got FM'd last night. Final score...1-0. With a goal in the 1st minute...an OG off the keeper. I was convinced Dundee were going to score. I've also had an odd bug where someone who was starting 75% of matches was always moaning about playing time, no matter what I did. So eventually I put him on the list...enjoy Shaktar Donetsk, Mr Rogic !! Now waiting for the queue to form outside my office - I might get one of them traffic light things on my door, or a trapdoor and piranha pool...."You have outlived your usefulness, Mr Gordon"
How exactly do you use the "encourage" shout? Every time I use it, it seems like my players all get frustrated with me. In what situation should I be shouting it? So far, I'm really enjoying this FM!